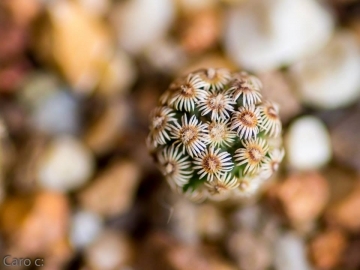 With the uniqueness of the spine patterns this tiny plant is a real gem and one of the most sought-after and distinctive species of Mammillaria. Origin and Habitat: Central Mexico, Oaxaca, Tehuacan-Cuicatlan Valley (extent of occurrence less than 5 km²). Altitude: About 2200-2300 metres above sea level. Habitat and Ecology: Mammillaria hernandezii grows barely above ground in open spaces in oak-pine woodland and in patches of grass on limestone slopes. Its range is severely fragmented and there is a continuing decline in the quality of the habitat and numbers of mature individuals due to the impacts of grazing by goats. Stems: Depressed-globose to globose, soft, dark green, usually not more than 2,5 cm in diameter and height (but in cultivation it can slowly grow up to 4,5 cm in diameter). Without latex. Tubercles: Pyramidal with short white wool in the axil. Radial spines: 17 - 25, white, cream coloured or tan, radiating, somewhat pectinate and curved backwards, not interlacing, 1.2 - 2.2 mm long. Flowers: Cherry red to fuschia-red (or occasionally white) with a paler throat, relatively large in relation to the stems size, up to 20 mm long, 2,5 cm large. The flowers are diurnal and close at night. Blooming season: A characteristic of this species is that, at least when cultivated northern Europe and US, the flowers appears during Autumn and Winter, and often fails to develop properly due to cold, damp, and lack of light in a temperate climate. A sufficiently sunny October day is needed to prompt them to open. Fruits: Remains embedded in the stem. In the wild this plants contract considerably during the dry season, sometimes pulling down completely under the soil level. 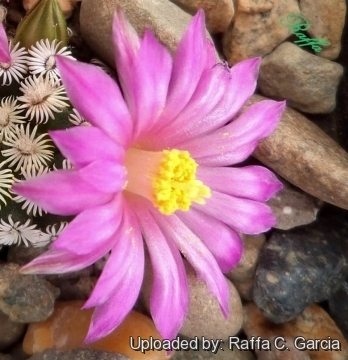 Frequently the flowers push up through the dirt from the underground cactus body. In fact, even though this plant shows new growth each year, it hardly gets any larger, and its dimensions remain unvaried year after year, as the individual stems tend to contract at the base. The new growth produced during the vegetative season compacts considerably and retracts, sometimes pulling down the plant completely under the soil in the hottest months of summer and coldest months of winter. 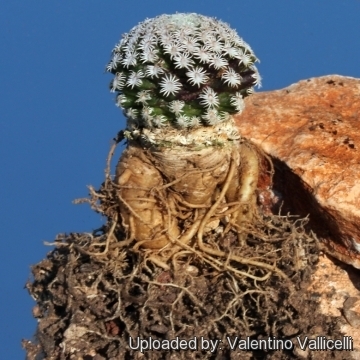 Comment: Cryptocarpic fruit: Mammillaria hernandezii is one of the few species of cactus with cryptocarpic fruits. That is, the fruit and seeds are produced and retained inside the stem of the plant. After the flower is finished and dropped off, the stem closes over the fruit and the fruit/seed gradually ripens within. The following years the fruit may remain within the body at the axil, or may protrude a bit. A thin membrane will be above the part where ripe seed can emerge. As the plant swells with the new growing season, the membrane fractures, and some seeds from the past years can little by little drop down and germinate in the close proximity, forming small colonies. But usually the seeds remain within the plant body for several years (usually about 9) or for the whole life cycle, and frequently they will be released only at the death of the plant, after the disintegration of the old stem. It is possible to collect fruit and seeds only by means of a thin pointed forceps. The seeds' vitality lasts for many years, and moreover seeds contain inhibitors that preserve them from premature germination. Generally fresh seeds won’t germinate very well; only old seeds do. The complete germination of this kind of seed may take several years (Some will sprout unexpectedly after 5 or 8 years!) 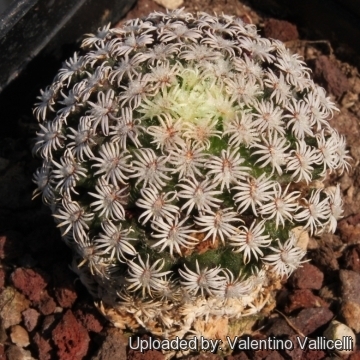 Because of the above peculiarity, seeds and plants of cryptocarpic Mammillaria (Series Longiflorae) are seldom available from commercial sources. Viability, measured as the proportion of germinating seeds, varies widely and is not correlated with seed’s age (e.g. 77% in 8-year old M. hernandezii seeds). Germination speed, however, increases with age. That is, given the opportunity (humidity) to germinate, older seeds do it faster. Slow release of fruits in these species introduces a time-lag mechanism that has important consequences on long-term population dynamics. It reduces both population growth and its temporal variability. This may account both for the rarity of these species, and for their long-term population stability. This makes them highly vulnerable to habitat disturbance and has implications for the strategies required for their conservation. 3) Arias, S. & Martorell, C. 2013. 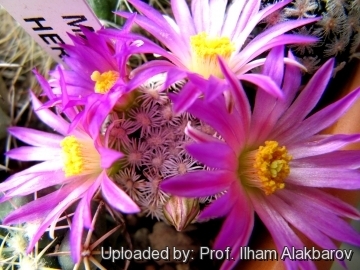 Mammillaria hernandezii. In: IUCN 2013. IUCN Red List of Threatened Species. Version 2013.2. <www.iucnredlist.org>. Downloaded on 20 February 2014. 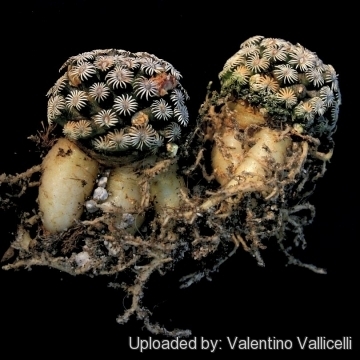 Cultivation and Propagation: Slow growing M. hernadezii is not the easiest of Mammillarias to grow and keep. The plant is often seen grafted, as most of the available stock has so far been propagated this way. Grafted plants grow fast and are very floriferous. 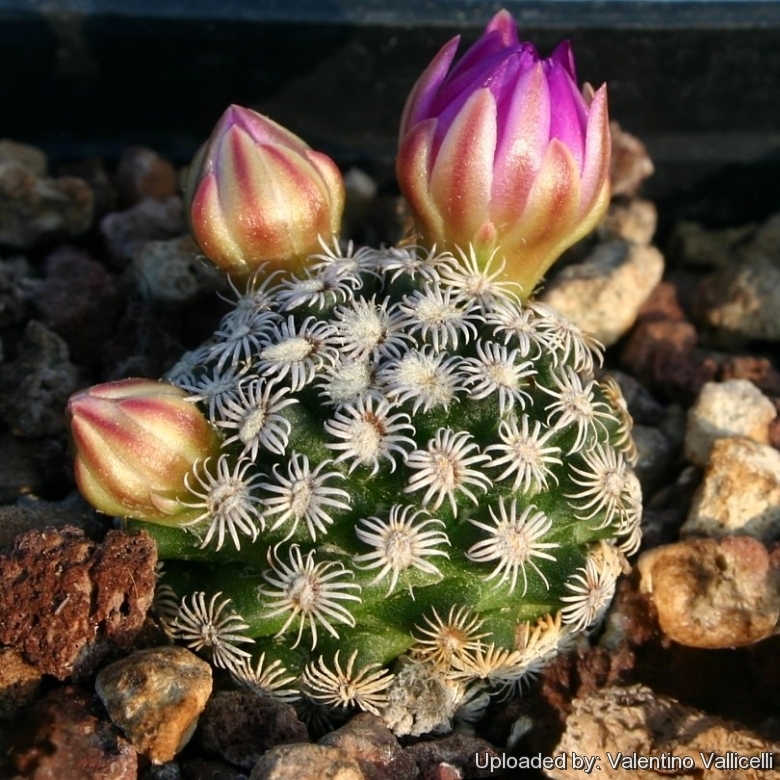 But it is not so very difficult to cultivate plants on their own roots given the same care with drainage and watering that is afforded to other species of Mammillaria with fleshy roots. 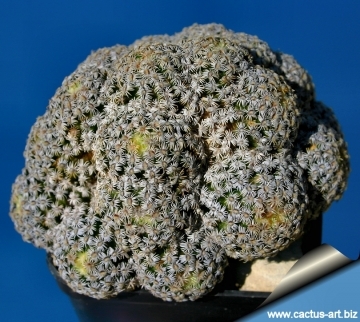 It require a mineral-based potting mix and needs to be kept dry in winter. Pot plants are quite wet-sensitive. Care must be taken with watering, and they need good drainage. Water sparingly during the growing season, keep very dry in winter. 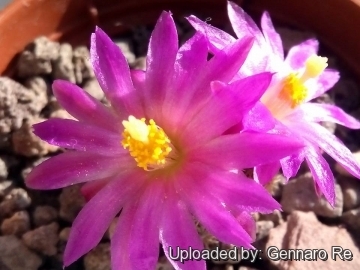 Usually it is recommended to over-winter this plant in a bright and warm greenhouse with at least 8-10° C , but it has proved to tolerate temperatures as low as -5° C for short periods. Th"hernandezii"i" needs full sun!!! Poorer luminosity levels produce a green anaesthetic plant with open, far and wide spaced areoles. Propagation: Seeds, cuttings or grafting. Not too difficult to raise from seed, but germination of the seed can still prove to be a challenge. Seeds can be sown in the spring or summer. The seedlings should not be disturbed until they are well rooted, after which they can be planted separately in small pots. Cuttings (if available) root well but plants on their own roots are quite slow.